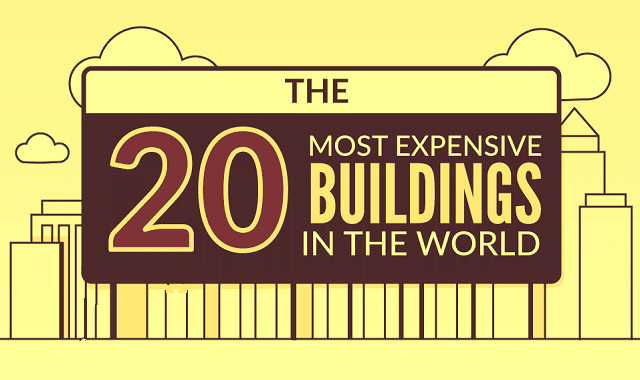 The 20 Most Expensive Buildings in the World #Infographic ~ Visualistan '+g+"
Architecture is one of the world’s greatest beauties, and wherever you go in the world you can admire extravagant design and style. For example, travelling to Singapore you’ll find the Resorts World Sentosa, as well as the Marina Bay Sands, while in the United Arab Emirates you can marvel at the Emirates Palace in Abu Dhabi, and the Burj Khalifa in Dubai. However, while these buildings all cost more than 1.5 billion dollars each to build, none of them top the list of the most expensive buildings in the world. We were of course intrigued to find out then what was the most expensive building in the world, which only consists of two storeys and costs a whopping 100+ billion dollars to build. However, we won’t ruin the surprise; take a look at the infographic below to find out more about where you can find the most expensive building in the world.